Yesterday during the SMX West keynote, Danny Sullivan asked Amit Singhal (Google’s head of search) a question that has been on the minds of many webmasters lately: How is Google balancing the interests of users, who want answers immediately through Knowledge Graph, and the interests of webmasters, who provide the content for those answers. What ensued was the most elaborate dancing around a question that I’ve seen since the last Presidential elections. Amit likened Google to a Swiss army knife. Whereas previously Google just provided 10 blue links (the “knife”) they are improving their product by adding additional features that users want, such as weather results (“bottle openers”). Amit argued that although Google now provides more features, people will still visit external websites if they require other services (“screwdrivers”). This analogy falls apart for several reasons. First of all, Google has been expanding Knowledge Graph and other search features to return results for more and more terms. 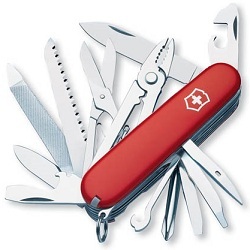 To use Amit’s analogy, they are adding more and more tools to their “swiss army knife”. Websites about bottle openers now receive less traffic and could go out of business because Google now provides that service, and other content producers are fearful that Google will one day expand to include their niche as well. Secondly, and perhaps more crucially, Google doesn’t even make bottle openers, it STEALS them from other businesses. Google doesn’t create the majority of “knowledge” in its Knowledge Graph, it takes it from other websites. It was funny to watch Amit preen on stage about how “awesome” Google is, when it is effectively just a scraper site that takes content from other people, and is increasingly biting the hand that feeds it. One of the largest sources of Google’s Knowledge Graph is Wikipedia, and it will be interesting to see how Wikipedians react to Google’s increasing commercialization of their information. Wikipedia has been such a successful project because it has attracted thousands of idealistic contributors who work on the project for free. The website is adamant about not showing ads because it does not want to commercialize the content created by its free volunteers, but such a stand seems increasingly pointless if Google is scraping that same information so it can show ads on its own site. Wikipedia volunteers are effectively working for Google for free, so that it can sell more search ads. For content producers, Amit’s talk gave little comfort that Google understands or cares about the needs of webmasters. Amit repeatedly stressed the importance of creating the best experience for its users, but didn’t spare many words for the content producers who are the backbone of Google’s product. In the hierarchy of Google’s constituents, users come first, advertisers come second, and content producers are a distant third. Andrew Allsop on Pinterest Links Dofollow Again? KeshKesh, Proudly powered by WordPress.